 In a sort of nouveau Dharma Bums, drifting in and out of Bay Area counterculture and the High Sierra, young Californian Duane combines a climber's journal with a memoir of the year following his graduation from Cornell. This writer hates cities and loves mountains so much that he dropped out of his junior year in Paris and headed for the PyrÇnÇes instead. Rejected by grad school, having ``failed at the Ivy League,'' he watches fraternity brothers get jobs at places like Salomon Brothers. (``Guys twenty-one years old wore the same suits as the broken-down old timers, both letting careers eat the whole middle out of their lives.'') He heads west, gets a job in a mountain-climbing equipment store in Berkeley, his hometown, hangs out with his youthful but wise parents, former 60's civil-rights activists, and cautiously, gently begins an affair with Kyla, a feminist organic gardener at U.C. Santa Cruz who worships the Goddess and wonders if she's gay. In one scene, naked in a meadow, they eat guavas while making love. Seeking some kind of logic and order to his life, Duane, under the tutelage of his father and uncle, both of whom are middle-aged and in better shape than he, sets himself the painstaking task of preparing for, and climbing, the biggest and most dangerous rock in the Sierra--El Capitan. 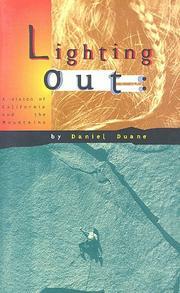 On the granite faces of Yosemite, Duane's prose comes most alive. ``As we slid down our ropes the hues of cloud and stone on Half Dome continued to shift, light and vapor painting and repainting the wall.'' In the arenas of sport and love, he learns patience, understanding, and how to confront his fear. Lively and engaging, if sometimes too earnest and self- indulgent, this is a good graduation present for those Generation X-ers who can afford to be nonmaterialistic these days.